In this episode, the gang returns to familiarity- the school, the bakery, the park, the icy stares of hundreds of agents representing cold, cruel death. Okay, those are new. The formal introduction to D-Reaper back in the Digital World was plenty unsettling. Its emergence in the real world was startling. The final element that really ties the true enemy together into a giant pool of nightmare fuel is its army of sentries. While they were briefly seen last episode, the Agents of D-Reaper introduce themselves properly here, and are the monstrosities that not only provide the bulk of the action, they really get into your head. And, of course, there's no way at all that these “agents” could be in any way evocative of the angels from Neon Genesis Evangelion. Their names don't even end in “-iel.” Actually, the official names for the two agents appearing here are “Searcher” and “Pendulum Feet,” which are dull and boring and never used in the dub. The agents seal the deal on this series by providing not only tangible enemies for the good guys to fight, but doing so with an eerie, grotesque appearance that is clearly neither human nor Digimon. Digimon can look like just about anything, so it's a tall task to create an enemy that distinguishes itself. The success lies in the agents being soulless, moving only when it's in their programming and having designs that scream function over form. 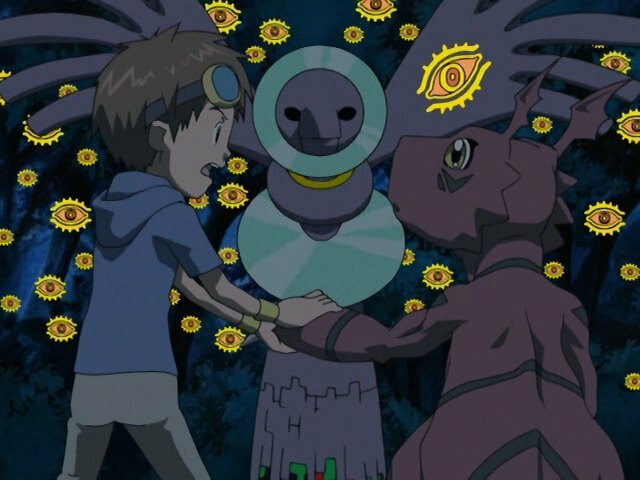 Even the ugliest of Digimon look like living creatures, but the agents are not quite there: Searcher is birdlike but most definitely not a bird. Searcher isn't even all that dangerous, but the appearance of hundreds of them with glowing eyespots, staring down the tamers with no attempt to engage or retreat, is a frightening way to introduce the concept. Not only due to the image of it, but because their status as information gatherers presents D-Reaper as calculated. A blind blob of chaos devouring the world is bad enough, but now it can observe and analyze potential threats in order to develop a counter-attack. That's where Pendulum Feet comes in. 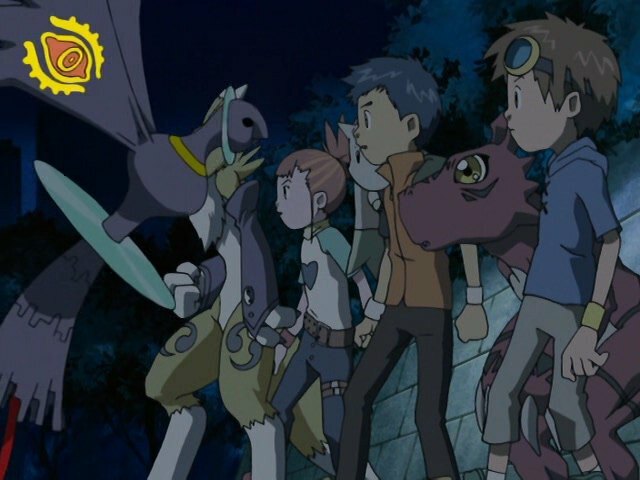 It may be underwhelming when compared to the whole arsenal, but its ability to use a Digimon's attack against it (or Taomon's protective barrier in defense) exemplifies what the tamers are up against. If not for this battle against Pendulum Feet, it's actually something of a chill episode for the tamers. After one look at the swarm of Searchers, the tamers call it quits for the night, overnighting in the school and turning breakfast in the Matsuki bakery into an outright party. They sure aren't breaking bread for one last meal. Yamaki, Riley and Tally find them and integrate them into the Hypnos/Monster Makers operation, with both the Tamers and an out-of-seclusion Shibumi explaining what D-Reaper is. True to his Lain roots, Shibumi's explanation adds a pretty striking edge to the series, speculating that D-Reaper might be attacking the real world because it believes mankind has exceeded its allotted space and is now too large for its programming. With a theory like that, when are we introducing young Digimon fans to the Human Instrumentality Project? Despite all this D-Reaper stuff, the true breakthrough in the episode, and certainly the primary source of feels, is Impmon reconciling with Ai and Mako and using this revitalized bond to evolve properly and save the tamers from Pendulum Feet. While Henry's sensei giving Impmon directions is certainly a random encounter, it's thematically appropriate given his prior lectures about good and evil. Impmon is certainly out of his evil phase, reinforced when Ai and Mako are not only happy to see their partner again, but had recognized how they drove him away and reformed on their own. Ai and Mako's offstage transformation is quietly remarkable, demonstrating that this whole Digimon partnership thing doesn't require a lengthy adventure or even camera time to change people for the better. Yes, that's right, the military guys aren't gung-ho morons! It's a small miracle that the military presence recognizes the uniqueness of the enemy they're up against and sends in a surveillance camera to see what D-Reaper looks like on the inside. It isn't pretty, and it's dissolved before they learn anything useful, but A for effort, guys! Shibumi explains his absence by calling it a midwinter's dream. More Shakespeare allusions! I like this guy! While it requires a pretty epic Alice ex machina to overcome, the fact that bio merge is impossible now that the humans aren't data anymore is a more natural and logical way to inhibit evolution for plot purposes. Zero Two could have learned from this. How does Yamaki call it D-Reaper before he finds out what it is? 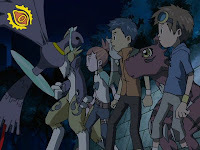 "It may be underwhelming when compared to the whole arsenal, but its ability to use a Digimon's attack against it (or Taomon's protective barrier in defense) exemplifies what the tamers are up against." A very ugly Ditto, from the sounds of it.